NEW - Sample Grantee Survey used to evaluate a funder's impact on its grantee nonprofits as well as to assess the various internal and external issues affecting these nonprofits. This sample is a formatted version of the survey, which was originally done in SurveyMonkey. 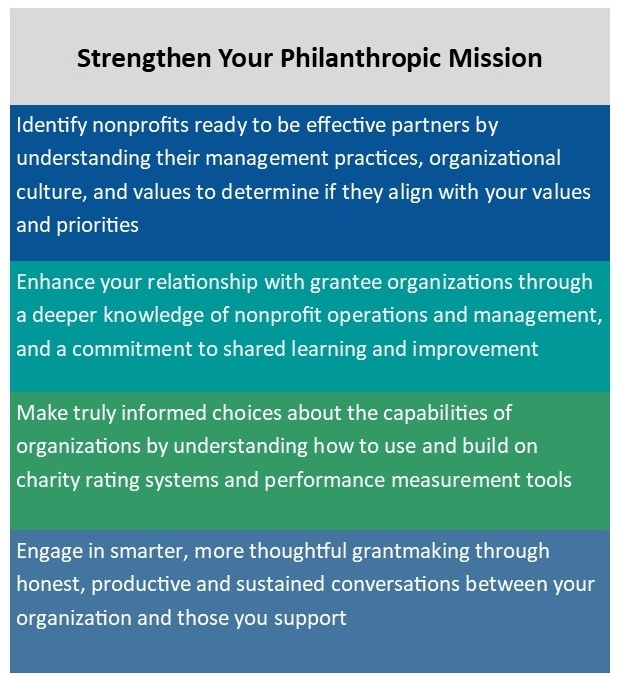 Management Factors Score Sheet - If you are a funder, donor or family foundation, and you are interested in exploring the qualities of a potential nonprofit partner beyond what you might discover through a standard, due-diligence process, take a look at this new score sheet. It offers thought provoking questions for organizations that can really up your philanthropic game! This checklist can also be tailored for your specific interests and needs. Check out this article on how family foundations can up their philanthropic game by using a tool such as this score sheet - "Change Up Your Questions." This material was the basis for a presentation of the same name at the 2018 Exponent Philanthropy National Conference in Philadelphia. Download copies of 1) PowerPoint Presentation from that session and 2) the Resource Handout that can help any funder to examine its practices and make adjustments along the way. Practical advice in two August 2017 Blog posts - "Renovate Your Philanthropy" in the Nonprofit Thinking section of our website and "Who Will be Thankful for YOU This Thanksgiving"
Click on these links for shareable PDFs of "Renovate Your Philanthropy" and "Who Will be Thankful." National Council of Nonprofits' blog on great funder/grantee relationships, including "Are We Talking About the Weather" as a featured resource. The National Center for Family Philanthropy online resource center. Vu Le's checklists for grantmakers and grantseekers from the "Nonprofit With Balls" blog. Absolutely worth a read - whether you are a funder OR a nonprofit.